Lüski, Aïm Deüelle. 2010. «Kefar Shalem's ruins». As with Optical Illusions, an Extended Gaze at the Drawing Extricates It from Its Frozen State: On Aïm Deülle Lüski's Exhibition "The Principle of the Least Action"
The election campaign had started few months earlier, when Mir-Hossein Mousavi announced his candidacy. The prime minister during the wartime era, when he handled the economy with relative success, Mousavi had been openly critical of the current government.He received the support of most reformist parties and of other intellectuals who had sanctioned previous elections. In the weeks leading up to the election, live television debates were broadcast, causing great anticipation and inciting many who had never gone to the polls before to vote. Many taboos were discussed in the debates, and the regime’s power structures were publicly criticized for the first time in the media 1. When, to everyone’s surprise, Ahamadinejad was re-elected, the results and the way in which they were announced created high levels of suspicion and resulted in a public outcry. 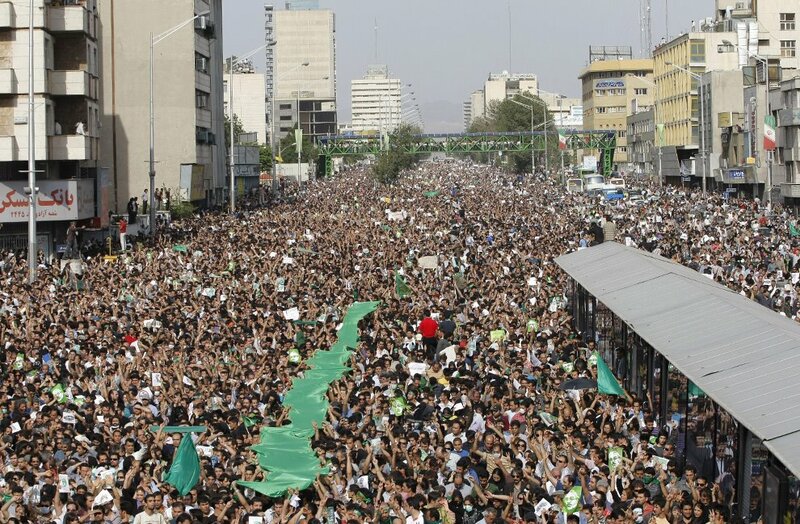 In the days that followed, millions marched in the streets peacefully in spite of the government’s ban on the rallies, protesting the results and forming what has become known as the Green Movement. 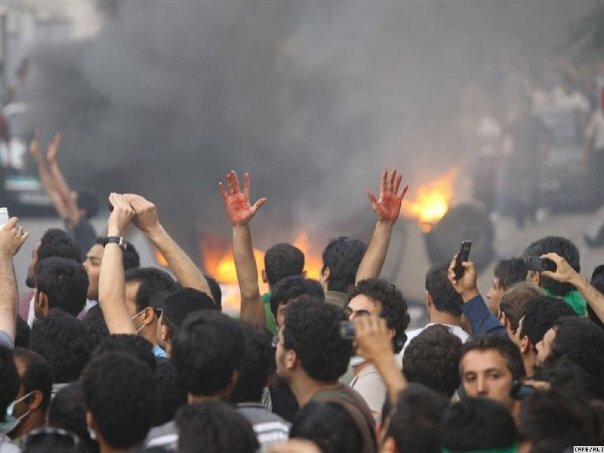 In an effort to contain these protests, the government imposed extreme control measures: it heavily censored the Internet, disconnected cell phone connections, cancelled licences held by opposition media outlets and foreign journalists, and attacked protesters. Hundreds of people were killed, and thousands imprisoned, in the protests and the ensuing raids2. 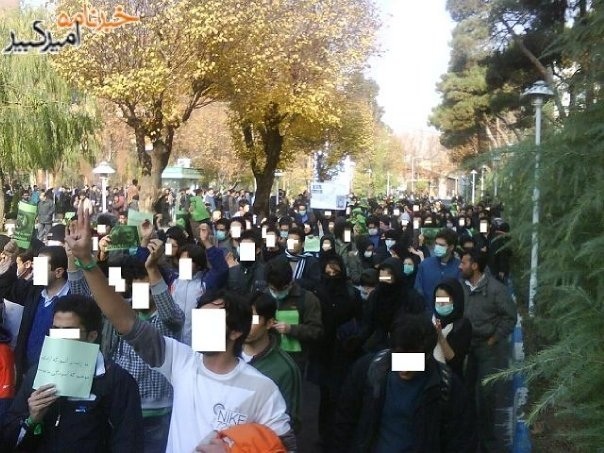 «A specter is haunting Iran: the specter of the Revolution! on Revolutionary Road». 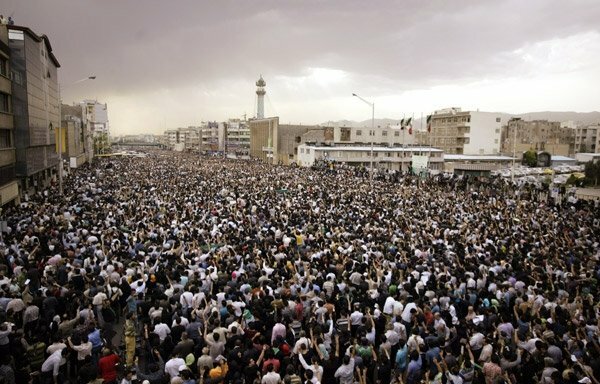 Two years later, the Green Movement remains an active political force in Iran, shaped by the memory of these events. Iranian society, which had gone through a violent revolution in 1979 and continues to struggle with the revolution’s successors, has become cautious enough to not seek a solution in yet another revolution. Rather investing in studying the velvet revolutions, the Green Movement continued to reinvent itself following the initial protests, without leadership, by creating new modes of civil resistance with the nightly rooftop chants in June 2009 at the cusp of them, such as writing anti-regime slogans on bank notes, repeatedly spraying green-coloured graffiti on walls, publishing underground newspapers with secret distribution networks, printing of other anti-regime flyers, and holding of strikes. Through their multiplicity and defiance of the bans on documentation, these photographs stood apart from traditional journalism in their power to foreground the connective tissue between the images and their referents. An integral part of the initial emergence of the Green Movement, photographs and videos taken with cell phones and digital cameras and distributed through Flickr and YouTube served as evidence of what was happening, while helping the movement gain strength. As the government was publicly denying the scale of the protests and limiting access to means of planning and communication, photographs simultaneously offered a way for the outside world to witness the events and for the movement itself to organize and comprehend its own scope. Through their multiplicity and defiance of the bans on documentation, these photographs stood apart from traditional journalism in their power to foreground the connective tissue between the images and their referents. As the physical reality of the events was collectively and anonymously recorded, the protestors were consciously implicating themselves, their subjects, and their audiences in the political act of photographing and being photographed. They placed viewers, regardless of their geographical location, among the protestors, creating an ephemeral community around the photographs’ production, viewing, and distribution3. Thousands of photographs that narrate the emergence of the movement and the violence of its initial protests remain archived on Flickr, on Facebook, and in blogs, and they continue to occupy a position that is much more complex than that of evidence. They form an active collective memory that defies historicization by operating rhizomatically rather than hierarchically. They also allow for a reconstruction of countless individuals' personal experience of the events, and they place all other manifestations of the movement in a position of response to its initial force. They form an active collective memory that defies historicization by operating rhizomatically rather than hierarchically. What is to be done with the archive of these images, as well as the blog posts, Twitter updates, and stories told through Facebook updates? How do we situate ourselves as their audience, taking a position that responds to their continual role in the movement? How do such traces of an event contribute to its collective memorialization, and in what ways does this memory differ from the official story? In the last two years, two major libraries have initiated projects that appear to provide a sense of security that this information will not vanish. The Library of Congress in Washington announced, on 14 April 2010, that it will “acquire” the Twitter archive4, and the British Library followed with its move to preserve blogs and Facebook updates as part of its collection5 There is currently no information about the specifics of the projects and neither one appears to directly address visual materials, although both attempt to absorb the vast amounts of information into existing research institutions. By taking this action, they “validate” these sources as worthy of being preserved for posterity or as historical materials. Opening the discourse of preservation in relation to the Green Movement photographs, however, threatens to mark the movement as a completed event of which the archive is evidence and of which we are “historians.” This paper is our attempt to locate a different way of viewing – one that positions the images and their archive as active agents in the events, whose meaning continues to develop as the movement’s goals shift. Viewing the photographs and the collective memory of the protests in the present, as dynamic and engaged, is integral to an understanding of the movement’s potential not as realized through the protests, documented and historicized, but as a continuously building system. The question, therefore, needs to shift from how the archive can be protected for the future to how it can continue to be understood in the now. The threat of a fixed history replaces the threat of forgetting: while we may have the tools to preserve these archives, these tools make the photographs into representations of a past event with a stable interpretation and a completed history, removed from the movement’s current manifestations6. However, if the images’ interpretation cannot be fixed, and our engagement with them is viewed as a continual unfolding of the event, then the positions that we occupy as historians, and as individuals who remember, carry a heavy ethical responsibility. The question, therefore, needs to shift from how the archive can be protected for the future to how it can continue to be understood in the now. The power of the Green Movement images lies in their resistance to being fixed in a linear time and place. Unlike the possibility of distance allowed by the official archives’ recontextualization, these photographs are not removed into a neutral space or classified according to an independent system. Instead, they constitute traces of the events as they were happening: on the blogs, Flickr, and Twitter, and through Facebook albums. There are instances of not knowing, of confusion and chaos, of making plans and sharing warnings, and of personal accounts. Facebook groups dedicated to recording the names of disappeared, imprisoned, and killed protestors are linked to their profiles and personal photo albums7. All photographs of the protests were made despite bans on documentation and the danger that the photographers and subjects would be identified. Thus, our act of looking at these images is intimately tied to a position of responsibility toward the photographed, not as bearers of witness but as participants. While looking through the archive, reading minute-by-minute reports with dozens of images that accompany them, or viewing countless Facebook albums of the protests, I was confronted with my sudden closeness to these events, and my simultaneous inability to grasp them. Each photograph contained the potential of being every other image that I had seen just seconds earlier: there was no safety in their singularity or framing. Each photograph extends and overlaps into a myriad of others, the dizzying quantity of the images multiplied by the cameras that appear in each one. At the same time, it is impossible to talk about the photographs as a unified whole, as that position would not allow me to acknowledge the power of the multiple individual gazes that have confronted me. A physical sensation of tragedy replaces the urge to locate the event in a specific time a place, to comprehend it historically: the event is now, and it is being moved forward through the power of the photographs – neither singular nor plural – to affect. Gilbert Simondon’s theories about individuation, as they connect with Henri Bergson’s ideas on memory, help us to view the photographs of the protests as an entity in active construction that constantly moves beyond reach through engagement with it. As Simondon proposes, information is not a given thing, but a tension between two orders in a state of disappearance, incompatible realities on the cusp of becoming a system8. This incompatibility, which marks information as relational, also forms the organizing dimension along which the individuation of a being occurs. Information is a tension among a set of orders that are able to produce a new system of organization, based on the impossibility of the system’s own stability. Thus, information can be read as a tension that produces the desire to construct the photographs of the Green Movement as completed entities, driven by a temptation to locate a set of stable referents. In acknowledging the impossibility and the danger of writing a fixed history, we can construct a position in relation to the archive of the images, a way to preserve their affective force. This position allows viewers to shift their attention away from a resolution and onto the tensions that find fleeting stabilities, giving rise to the potential for a way of looking at the archive of these photographs that responds to the structures of memory, as opposed to that of linear history. As Simondon proposes, information is not a given thing, but a tension between two orders in a state of disappearance, incompatible realities on the cusp of becoming a system. Memory is movement. It is movement, as duration is essentially memory: movement not necessarily in time but in density 9. It is the movement of thought, a dynamic process always in transformation, always mobile, always in-moving. Memory is not the past of the once-was but the past in the making, constantly reshaping and reconfiguring, therefore never final, never fully actualized, always in potential. Bergson attributes two types of movement to memory: rotation and contraction. What we are supposed to visualize is a telescope that we are pointing up at the night sky. Thus, when I am trying to remember something, I at first see nothing all. What will help us understand this image is the idea of my character. When I try to remember how my character came about, at first, I might not remember anything; no image might immediately come to mind. Pure memory for Bergson precedes images; it is unconscious. But, as I try to focus, as if rotating the rings that control the lenses in the “telescope,” some singular images come into view10. The second type of movement that Bergson attributes to memory is contraction11, which can also be explained through the example of the telescope. A telescope narrows down the image, so that the image of a whole constellation would fit in our eyes. The past is always in its totality, “Not only does the past coexist with the present that has been, but, as it preserves itself in itself (while the present passes), it is the whole, integral past.12 As we move toward the present, the past in its totality becomes ever more contracted, ever more dense. Remembering is therefore movement of thought not so much within time as within densities of the past. Both of these movements of memory can be seen. in relation to photography, to anchor viewers in the act of remembering. The structures of the online archive allow for the movements of rotation (focusing) and contraction, from the act of trying to reconstruct specific events through individual images, to the totality of both the archive and the events. Engaging with the photographs brings the memories into focus – a recollection of direct engagement for those who were present in the street, and a recollection of indirect engagement for those who followed the news closely. At the same time, remembering the events involves contracting the mass of images into an affective experience. It is the superimposition, metaphorically, of the images into a whole: a multiplicity that extends beyond singular frames – which are never fully actualized or contained within a single narrative – and is capable of inducing an event. To think of a past as fully formed and transportable to the present is to think of the past as a has been. It is considering it a being, whereas it is in fact a becoming, always in potential. Supposing the past as something fixed, something final, compels us toward thinking “what” rather than “how.” If “how” follows a more transductive approach and offers more openings, “what” in its totalitarianism presupposes being. To think of a past as fully formed and transportable to the present is to think of the past as a has been. The danger of the “what,” as opposed to the “how,” is the danger of preservation of the photographic archive of the Green Movement as a singular historical instance. This danger is in the assumption that June 2009 and the months that followed could be reconstituted as a memory of the event as a being, not an event that continues its becoming through its own memorialization. This danger is also in the image of the death of Neda as fixed in its historical significance, acknowledged by the World Press Photo competition jury of this year’s prize as worthy of a special mention, and archived through institutions under a set of keywords that tries to hold it to its totality in the past14. This brings us to the notion of individuation developed by Gilbert Simondon. Simondon’s main argument within the study of individuation is that the individual is never given in advance. It comes into being through a process of becoming, a process through which its potentials unfold in different directions. Potentials are at the centre of the pre-individual. Not only is the individual not given in advance, but it also is never final – always individuating but never a fixed completed being, never a closed entity. Through individuation the potentials keep rearranging themselves: they always remain in re-evaluation with the individual–environment multiplicity. The individual is never a completed being, as individuation is never able to exhaust all the potentials of pre-individual reality with one stroke15. These potentials remain, allowing for multiple further individuations to occur in the future. Remembering is, in its essence, always a form of forgetting. However, it is not forgetting as deduction or induction; rather, it is remembering in the form of transduction. Transduction, proposed by Simondon as the process through which individuation happens, does not, unlike deduction and induction, presuppose being. It studies the pre-individual and the becoming of the being. It is neither a reverse nor a replay of the ontogenesis: it is ontogenesis. Unlike deduction, it does not filter out the characteristics of the reality within its own domain only to extract the resolving structure. Unlike induction, it does not retain only that which is common, eliminating that which is singular. It begins at the centre of the being, and expands in various directions from this centre. It is pursuing the being in its becoming16. It is as much the peripherals of an event as it is the event within the frame. A singular photograph’s frame marks the boundaries of remembering and forgetting along which the photographic event unfolds. What remains outside the frame is a myriad of potentials that did not become resolved in the process of individuation of the single image. They remain on its periphery and have the capacity to provide new tensions and incompatibilities, thus pushing the process of individuation forward, or encountering other images that destabilize them and create new potentials. In the sheer quantity of the photographs of the Green Movement and their overlapping frames, the existence of these potentials is made manifest, drawing our attention to the movement as it continues to individuate through our act of viewing. 1. Rasool Nafisi, “In Iran, The Election Is Being Televised,” Commentary, Radio Free Europe, 9 June 2011; “Rafsanjani reacts to allegations,” Tehran Times, 10 June 2009; “Mousavi says Iran’s international status must not be undermined,” Tehran Times, 2 June 2009. 2. 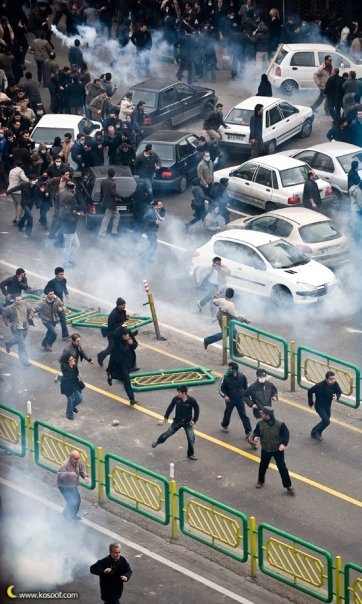 “Iran election: faces of the dead and detained”, The Guardian, 28 January 2010. 3. This position of ethical responsibility toward the photographed subjects, explored throughout the paper, draws on Ariella Azoulay’s concept of the “civil contract of photography” in her The Civil Contract of Photography (New York: Zone Books, 2008). 4. “Twitter Donates Entire Tweet Archive to Library of Congress,” April 15, 2010. 6. We are drawing here on W. T. J. Mitchell’s conclusion in “What Do Pictures ‘Really’ Want?” in which he presents the challenge of developing ways of talking about images that does not reduce them to illustrations or mimesis. W. J. T. Mitchell, “What Do Pictures ‘Really’ Want?” October 77 (Summer 1996), 82. 7. 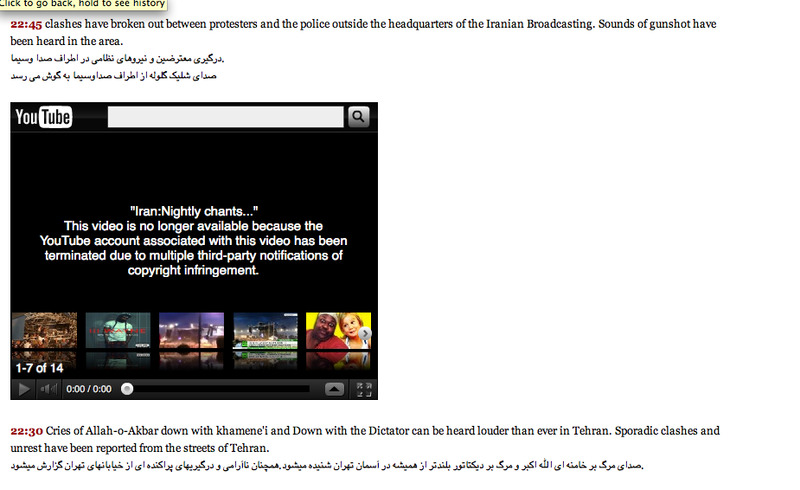 Some of these regularly updated sources include Saeed Valadbaygi, Revolutionary Road and Mir Mousavi’s Facebook page. 8. Gilbert Simondon, “The position of the problem of ontogenesis,” Parrhasia Journal, 7 (2009), 11. 9. Gilles Deleuze, Bergsonism (New York: Zone Books, 1988), 51. 10. “Henri Bergson,” Stanford Encyclopedia of Philosophy. 13. Erin Manning, “A Life: Waltzing with Bashir,” 21 (unpublished). 14. “Jury appoints a Special Mention,” 12 February 2010. James, Henry and Natalia Lebedinskala. 2012. “Green Photographs: An In-Moving Memory”. In Imaginaires du présent: Photographie, politique et poétique de l'actualité. Cahier ReMix, no. 1 (mai 2012). Montréal: Figura, Centre de recherche sur le texte et l'imaginaire. Available online: l’Observatoire de l’imaginaire contemporain. <http://oic.uqam.ca/en/remix/green-photographs-an-in-moving-memory>. Accessed on April 26, 2019. Originally from Tehran, Iran, Mazi Javidiani has received his Bachelor in Fine Arts in new media arts and cinema from Concordia University. He is currently an active researcher at the SenseLab, a Montreal Based research-creation lab run by Erin Manning and Brian Massumi. Mazi's work is composed primarily of new media narrative installations based on new cognitive philosophies and traditional Sufi and Buddhist practices. Mazi has also been an active film writer, specializing in Deleuzian philosophies, formal approaches, and Middle Eastern cinema. Natalia Lebedinskaia is a second-year MA student in Art History at Concordia University. Her research focuses on vernacular photographs, and their shifting meaning in public collections. In her thesis, in which she discusses the Makortoff Family collection from the Doukhobor community in British Columbia, she hopes to bring forth the role of personal agency in negotiating between tradition and assimilation. Natalia’s wider interests include ethics of display and curatorial responsibility, as they relate to nostalgia, memory, and representation of personal experience.